The Isle of Bute or the Island of Bute is one of the islands in Scotland and it is a part of the Firth of Clyde. Initially, the island was a part of the Buteshire County, but now it comprises part of the Argyll and Bute council. There is no doubt that the island is blessed with the beauty of nature, and due to this reason the place has turned out to be amazingly popular as a part of Scotland tourism. With the passage of time, the economical conditions and population in the region has scaled up, and tourism has definitely played a major role in it. Through this article, we will provide you some vital information about the island of Bute, particularly about its geography, population, attractions, etc. As per the official figures, the population of Bute has declined for some reasons. If we take a look at the records of 2001, the popular of the island was 7,228. However, after 10 years that is in 2011, the popular declined more than 10 percent. Yes, in 2011 the population of Bute stood at 6,498. It is interesting to note that during the same period (2001 to 2011) the population of Scottish island increased by over 4 percent. In 2011, the population of Scottish island was 103,702. The Isle of Bute covers an area of 122.2 square kms. Rothesay is the only town on Bute and it is connected by ferry that takes you to the mainland. 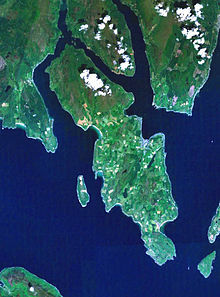 Port Bannatyne, Kingrath, and Kilchattan Bay are the three villages on the island. The Highland Boundary Fault divides the island into two parts. The north part of Bute comprises of hilly and mostly uncultivated region companied with dense forest area. Kames Hill is the highest hill in the region with its peak 267 meters above from sea level. On the other hand, the southern part of the region is quite smoother and the land is really fertile. Nevertheless, even the southern part features rugged terrain if you go ahead a little far. Loch Fad is the largest source of fresh water on Bute and it flows along the Highland Boundary Fault. The western region of the island is more popular for its beaches, and people enjoy excellent sights over the channel South of Bute. Ettrick Bay, St. Ninjans Bay, and Straad are the villages located on the western region of the island. There are numerous things to look out for on the Bute Island. The unconventional Mount Stuart House is one of the most remarkable neo-Gothic structures in the world. You can also visit some ruined chapels like St. Blanes Chapel and St. Ninjans Point. The former is related to Saint Blane and Saint Catan. Some of the gardens at Bute feature plants imported from different regions of the planet.